In 1996 the old bus passenger shelter at the end of Littlehamar Road, at the crossroads with A968, the main road of the island has been declared unstable and demolished. 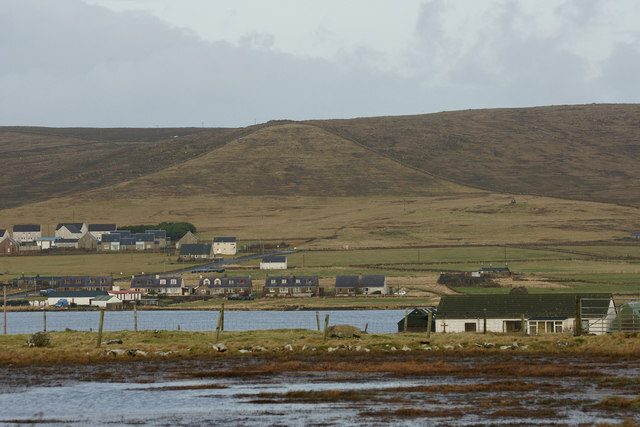 Children that were waiting the bus to go to the most northerly school of the United Kingdom would be exposed to Shetland rain, snow and wind if one of them, encouraged by his father, hadn’t taken the initiative in writing a letter to the local daily newspaper, the Shetland Times, the northernmost newsroom of the United Kingdom, asking for a new shelter for him, for his bicycle (used to reach the bus stop) and for his schoolmates. The Boy’s name was Bobby Macaulay and he was 7; his letter didn’t go unnoticed: the Shetland Island Council, the administrative local authority, installed the new red bus shelters that today are visible in Unst. Later happenings were instrumental to making the bus shelter so popular: few days after the installation of the new but shelter, someone furnished it with a table and a sofa made from basketry. Soon after a television and a little chafing dish were added, without anyone claiming this act of altruism. In winter an electric heater also appeared. and a carpet. 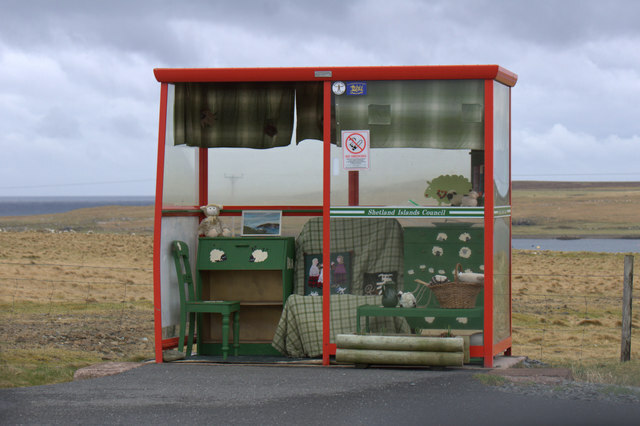 The Littlehamar Road bus shelter was becoming increasingly comfortable and, at the same time, it was popular with the Shetland population and beyond: the guest book filled with signatures and suggestions, from which stood out the request of a website, activated within a couple of years (1998). On the occasion of the new millennium celebration, a lot of small, scattered events were organized in the island. The bus shelter, too, had its little festival, the northernmost of the United Kingdom: several musicians played in it without a precise programme, and beside it a green bus was parked, inside which meals and drinks were served all day long. 2 – The “turquoise” theme in 2008. (© N.Mutton). In 2004 the cabin had to be moved by a few meters to allow the construction of a small parking lot, parted from the main road by a small traffic island dedicated to radio host John Peel, one of the memorable voices of BBC, died that same year in Cuzco, Perù. It probably consists of the only traffic island with its own toponym; and John Peel is perhaps the only person to whom a traffic island is named after. Every year the bus shelter is decorated following a new theme: in 2005 it was Africa, with giraffe-curtain and a book on the African continent; in 2006 the theme was “space” for the simple reason that the cabin vaguely resembles a “Tardis”  of the memorable TV series Doctor Who that was resumed by the BBC around that time after lying in oblivion for more than 20 years. Phil and Liz too, the two plush hamsters that live in a little cage inside the bus shelter, are dressed up according to the current theme. Year 2007 inaugurated the colour series with the yellow theme, followed by turquoise the next year and by pink in 2009. 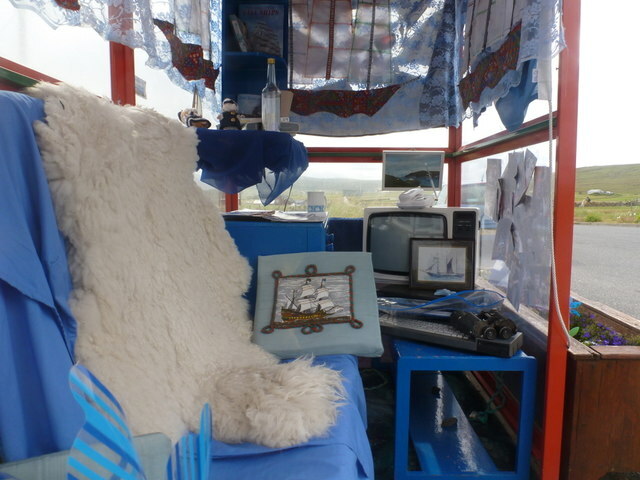 3 – Interior: the “Tall Ship’s Race” theme in 2011 (© C.Downer). 4 – The “sheep” theme, 2013. (© M.Pennington). 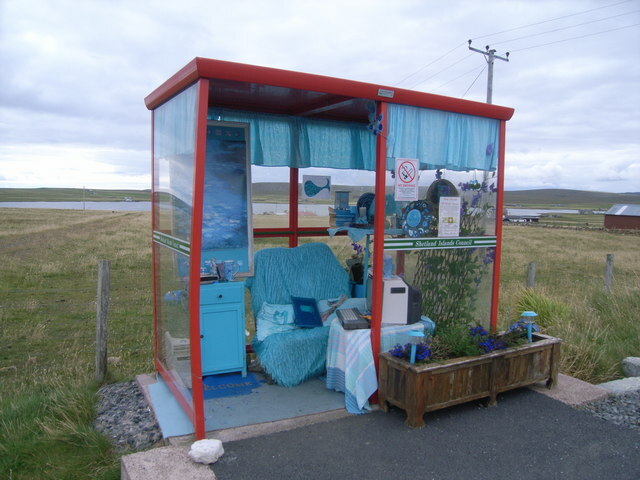 The Unst Bus Shelter Website. Whyte, David. Scotland. Melbourne: Hunter Publishing, 1998 (p. 178). © Mike Pennington, 11-12-2011 [CC-BY-SA-2.0] da Geograph. © Nicholas Mutton, 22-08-2008 [CC-BY-SA-2.0] da Geograph. © Cris Downer 31-7-2011 [CC-BY-SA-2.0] da Geograph. © Mike Pennington, 21-4-2013 [CC-BY-SA-2.0] da Geograph. Maps by Maps Marker Pro. Originally published in Italian 5th Jan, 2014. English translation by: Eleonora Spartà.